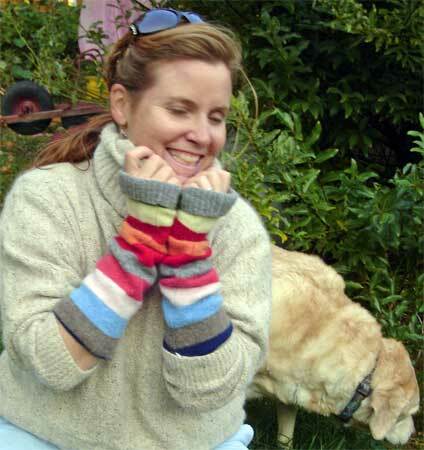 Last Christmas my mother-in-law crocheted me a pair of handwarmers, or fingerless gloves. 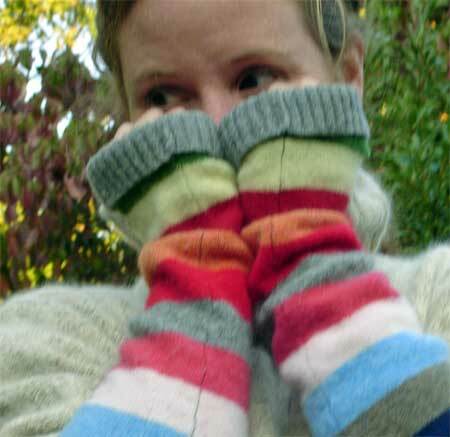 They’re perfect for this transitional season when it’s too cold to go gloveless and not cold enough for the whole mitten. I needed an extra set to keep in my car when I forgot my favorite pair. Alas, mom-in-law has been on a sock-knitting frenzy. Not wanting to mess with her heel-toe mojo, I decided to make a pair of handwarmers myself out of a fulled sweater sleeve. So here’s the tutorial on the sweater-sleeve hand warmers I promised. I’ve been using these a lot, and they’re so cozy! 1. Full an old wool sweater. 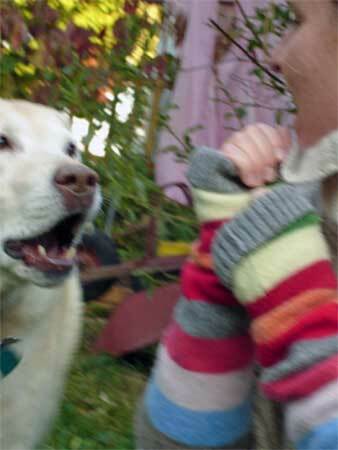 Find a fun wool sweater in the depths of your closet or at a local thrift store. I got my sweater for $7 at the Quakertown, PA, Salvation Army. (Awesome thrift store, by the way. It’s HUGE.) 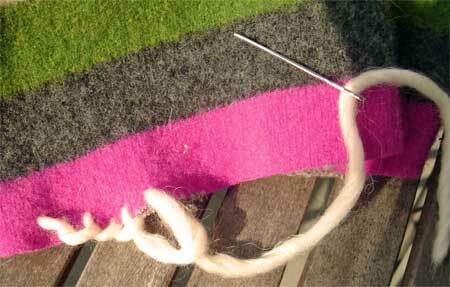 Run the sweater through the washer and dryer with other clothes, preferable on hot to shrink and full the sweater. 2. Cut the sleeves off. 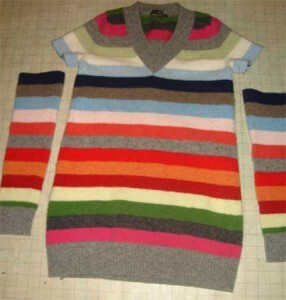 I thought the stripes were funky and decided to go with whole-arm-warmers. 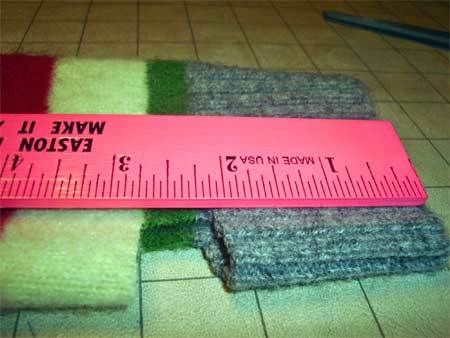 These reach to my elbows, so I cut them to a length of 15 inches. 3. Cut holes for your thumbs. 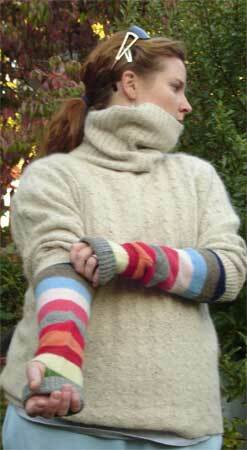 The cuff of the sleeve is the top of the handwarmer, by your fingers. 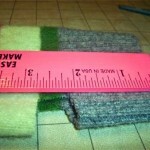 Measure 2 inches below the top of the cuff. 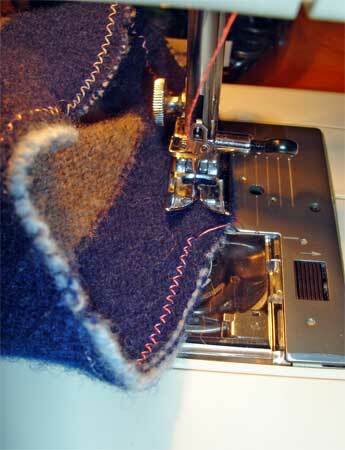 Cut a hole 1/2 inch by 1/2 inch, through both layers of fabric. The 2 inches allows me to fold them down a bit when I need more dexterity and fold the cuff up to my knuckles when I need the warmth. 4. 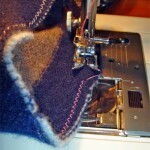 Machine sew around all the cut edges.